The deadline to get your tickets has been extended to Sept. 28th. Call today to get your tickets! 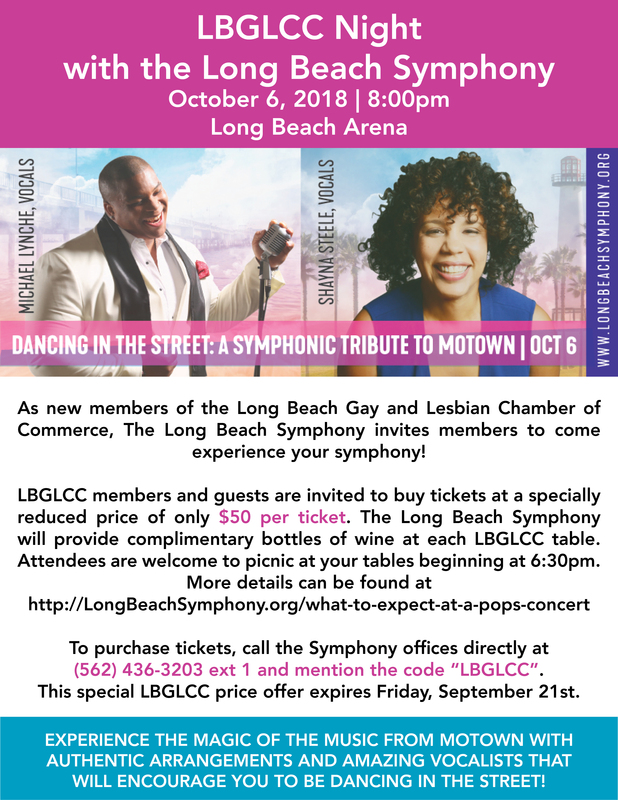 The Long Beach Symphony invites members to come experience your symphony! LBGLCC members and guests are invited to buy tickets at a specially reduced price of $50 per ticket. The Long Beach Symphony will picnic at your tables beginning at 6:30pm. To purchase tickets, call the Symphony offices directly at (562) 436-3203 ext 1 and mention the code (LBGLCC). This special LBGLCC price offer expires Friday, September 21st. EXPERIENCE THE MAGIC OF THE MUSIC FROM MOTOWN WITH AUTHENTIC ARRANGEMENTS AND AMAZING VOCALISTS THAT WILL ENCOURAGE YOU TO BE DANCING IN THE STREET! To purchase tickets, call the Symphony offices directly at (562) 436-3203 ext 1 and mention the code (LBGLCC). This special LBGLCC price offer expires Friday, September 28th.